As 2017 starts winding down, studios are going to be more aggressive about getting their movies noticed by the Academy so that, come time for Oscar nominations, their movies have a shot at scoring some gold statues. Warner Bros. has a few big contenders this year, with Dunkirk a sure bet for major awards. Wonder Woman is getting a lot of support and Blade Runner 2049 feels a bit like Mad Max: Fury Road in a sense. But now the studio has officially launched a campaign for IT, meaning they feel Pennywise and The Losers Club are Academy Award-worthy. Warner Bros. has created a "for your consideration" page for IT, which puts it squarely in the Oscar race. Or, at least that's the hope. According to the page, the studio has high ones. The page has the movie listed to be considered for Best Picture, Best Director for Andy Muschietti, Best Adapted Screenplay, Best Supporting Actor for several candidates, Best Supporting Actress for Sophia Lillis, Best Cinematography, Best Production Design, Best Film Editing, Best Costume Design, Best Visual Effects, Best Sound Mixing, Best Sound Editing, Best Makeup and Hairstyling and Best Original Score. Granted, the odds of IT being legitimately considered for many of the categories is a stretch, but Warner Bros. is putting it out there and is holding official screenings for Academy members. That said, it's not too crazy to think the movie could nab a few nominations. Categories like Best Makeup and Hairstyling and Best Costume Design are reasonable. 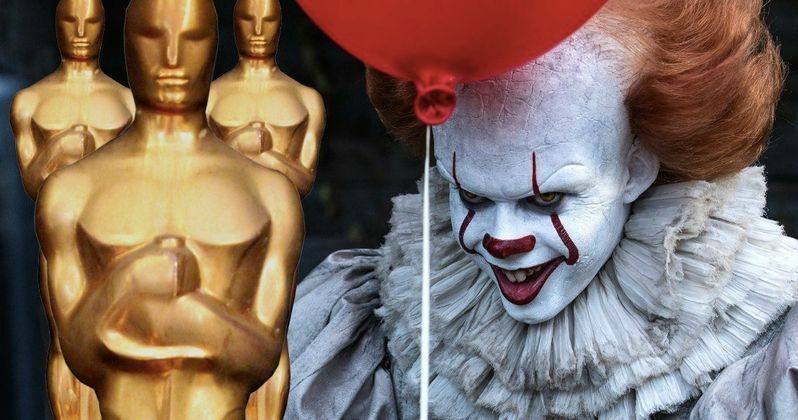 Then there are dark horse shots, like getting Bill Skarsgard, who brilliantly brought Pennywise to life for a new generation, a Best Supporting Actor nomination. And, considering the movie's insane success, there's certainly an argument to be made for Andy Muschietti for Best Director. However, Best Picture looks to be a pipe dream at this point. The other movies Warner Bros. is submitting for consideration are Blade Runner 2049, Dunkirk, The LEGO Batman Movie and Wonder Woman. That's some pretty good company to be in. It's also worth remembering that 2017 has truly been a monumental year for studio horror. IT has grossed a staggering $671 million worldwide, so it would certainly bring attention to the Academy Awards to nominate such a popular movie. There's also Get Out, which has a legitimate shot at a Best Picture nomination, among other things. So why not IT? Who wouldn't love to see Pennywise make his grand entrance at the Kodak theater next year? The Academy has made a conscious effort to diversify and has added a lot of new members. So that could change what kind of movies earn Oscar nominations this year and could make 2017 one of the most interesting races we've seen in a long time. If Warner Bros. is successful, we may see the most successful horror movie of all time bringing home a gold statue or two. Warner Bros. creating this for your consideration page seems to be much more than wishful thinking.